Conservation Status: LC least concerned but vulnerable to the pet trade. 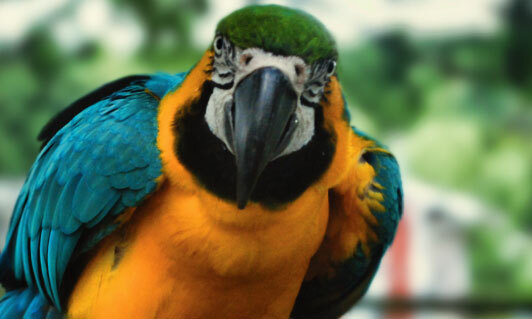 Members of the parrot family are commonly kept as cage birds. They are quite accomplished talkers and are considered highly intelligent. The beak is strong enough to easily crushed the hull of large brazil nuts. All macaws form permanent pair bonds and nest once a year producing 2-4 chicks. They sometimes travel in large flocks and can quickly strip the fruit or nuts from a tree. Habitat loss to domestic livestock and agriculture as well as poaching for the pet trade has reduced their numbers.